This is a tutorial on how to install and use the NordVPN app for iOS devices (iPhone / iPad). First of all, you should download and install the NordVPN app on your device. Note: NordVPN may be not visible in some regions with VPN restrictions. In this case, you may follow this tutorial on how to download our app from the VPN-restricted regions. The app icon will appear on your home screen. Tap it to open the app. You will see a pop-up of our Terms of Service. Tap on Agree & Continue if you agree to our Terms of Service. The Sign Up screen will appear. Tap Sign Up to create a new NordVPN account or log in to an existing NordVPN account by tapping the Log in here button below. Once logged in, you will be greeted with the main screen of the app. You can see the country map in the background, with the Quick Connect button in the middle. 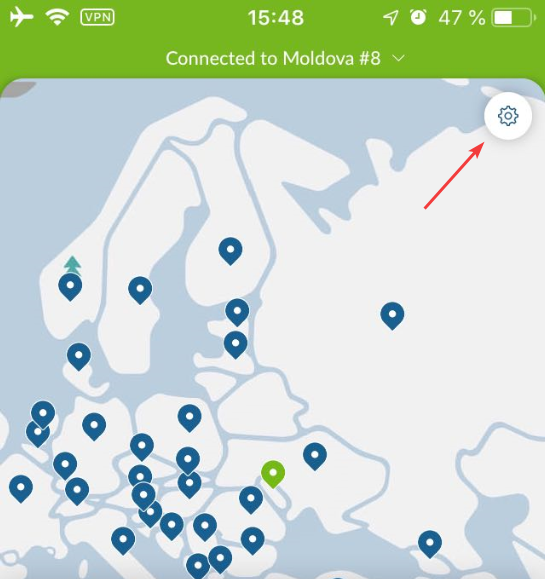 You can tap this button to quickly connect to NordVPN servers. Using a complex formula that includes various server parameters, Quick Connect chooses the best server for you at that moment. 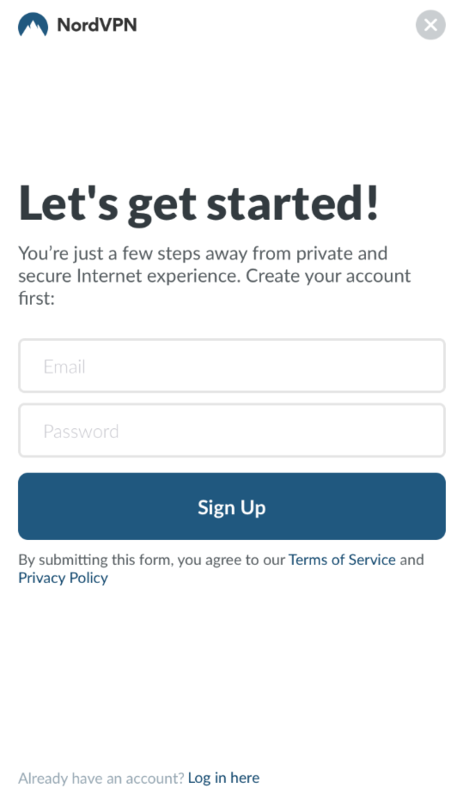 When connecting for the first time, a dialog window will open asking you to allow the NordVPN app to connect to a VPN server. You will receive a notification about it from our app. 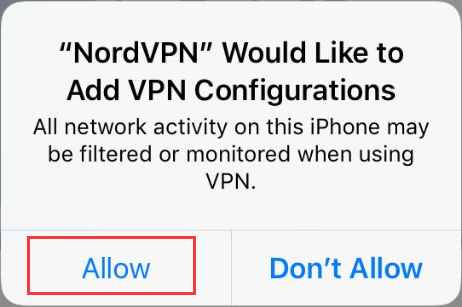 This is a default warning message, and since NordVPN is a trustworthy VPN provider, you can safely tap Allow. If you are using Touch ID, it will open the iOS settings. Use your fingerprint to allow VPN configurations. Once connected, the Quick Connect button will light up in green. 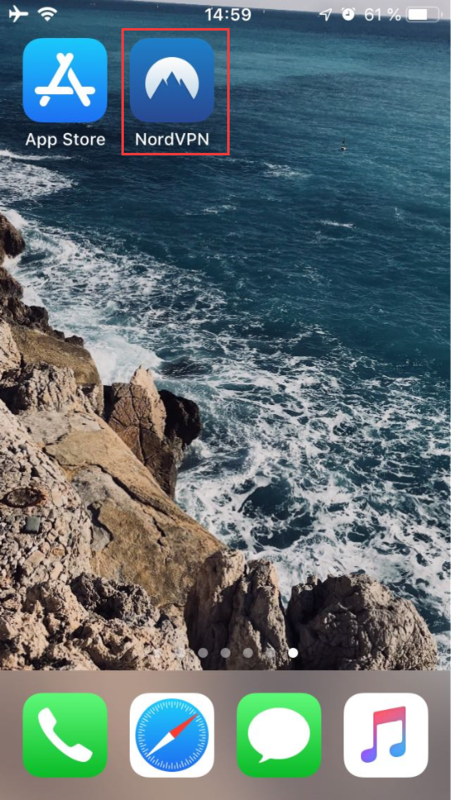 You will also have a “VPN” icon in the status bar at the top of your screen, indicating that you are currently connected to a VPN server. This icon will be visible from any app - that way you can ensure that you are always connected. You can also tap any of the country pins to open the server card of that country. 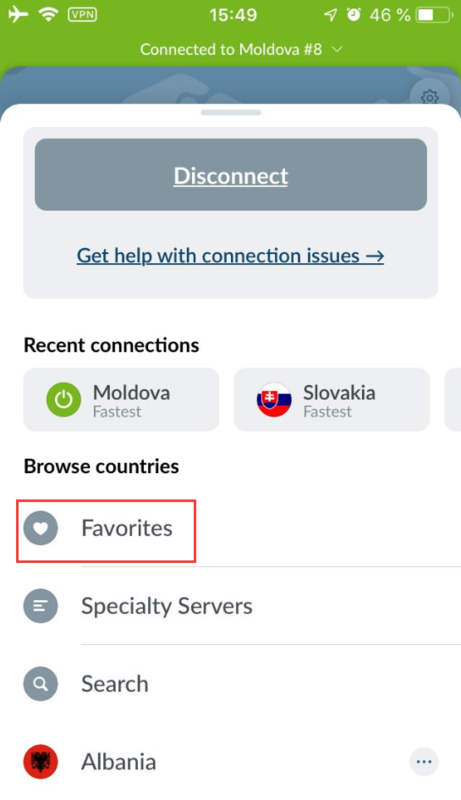 Tap the Quick Connect button for the best server or swipe up the country card to select a specific server. You can also tap on the three dots button next to a country name to select specific cities in that country. Our app determines which servers are the best for you based on various parameters and sorts them accordingly. You can also sort servers by name, load, distance, or speed. To add a server to your favorite servers list, click on the heart icon next to the specific server. You can access the favorite servers list by swiping up from the bottom. You will see a new Favorites category. 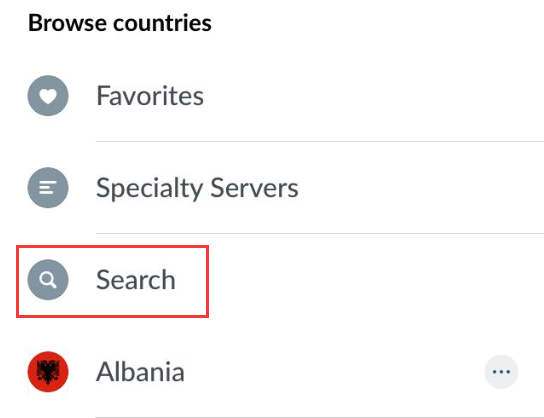 You can also tap on Search to search for a specific server number. In the top right corner of the app, you can tap on the gear icon to access your Account information and Settings. Here you can find information about your subscription and extra security options. 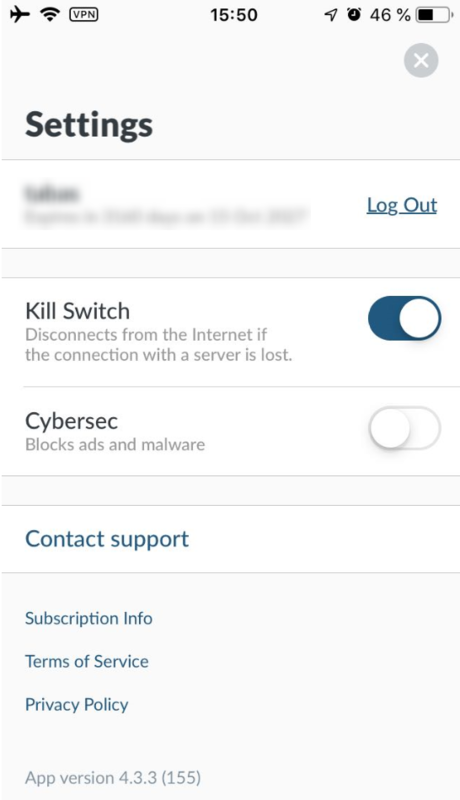 Kill Switch disables your internet access if you suddenly lose the connection to a VPN server. It also tries to reconnect to the recently used server automatically. Cybersec protects you from intrusive ads, malicious sites, and other threats. You can read more about this feature in our blog post here: https://nordvpn.com/blog/security-feature-cybersec/. The X at the top right corner will return you to the regular menu of the app.